Back in April, we wrote an article about how the new steel and aluminum tariffs would affect appliance brands and ultimately, your appliance buying decisions. Now, we have a much better idea of how tariffs may affect you in the near future, whether you’re a homeowner or a builder. In this article, we’ll review what the new tariffs are, how they have affected major appliance brands as well as the price changes you should expect to see in the future. To review, Samsung and LG were charged with 20% in tariffs this year and 50% next year on washers as a penalty for dumping products in the US. Also, there was a 50% tariff on “key components” to washers over 50,000 units. Dumping is selling products below the cost of production often times with government subsidies. It is designed to wipe out that countries industry. In this case, it was designed to hurt Whirlpool, the largest American appliance manufacturer. There were also 25% tariffs on foreign steel and 10% on aluminum. Mostly every facet of building a home has steel. Appliances are mostly made using steel. This tariff affects every foreign as well as domestic manufacturers. Oddly enough, the two least affected companies were…LG and Samsung. Samsung had a 4-7% increase in price changes but it was announced before the tariffs. LG prices have been minimally affected as well. Going Forward: As of now, Samsung hasn’t announced any price increases and does not have any availability issues. LG is a different story. Both companies are highly promotional around holidays with discounts of 10-35%. However, LG has indicated a decrease in promotions for 2019. Also, both companies have added significant US factories and production as a way to circumvent the washer tariffs. In 2019, they should have almost enough production capabilities to serve the US market. Fisher Paykel: 4% increase on refrigerators. Their laundry, however, bore the full brunt of every tariff with a 40% increase. Bosch/Thermador: Price increases across the board of 7-10% effective August 1, 2018. Their promotions have not changed with free dishwashers and hoods. Miele: Miele had a 7-10% increase effective August 1. Their 10% promotions have not been affected as of yet. Sub-Zero/Wolf: They had their yearly increase announced before the tariffs. Then they followed up with another. These are big stainless units. I would expect more increases next year. Have the Tariffs Affected Whirlpool? The tariffs were designed to protect American manufacturing. In this case, Whirlpool was the main beneficiary. Yet Whirlpool arguably has been affected the most. Certainly, their stock price has suffered. It is now 106 down from 166 back when the tariffs were announced. Their current, chronic lack of availability of product would suggest problems with steel and raw materials. Perhaps it is a problem with their vendors. As a result, their Jenn-Air division will now have their third price increase this year. Their next increase is 7.2% on all Whirlpool products like KitchenAid (chronic shortages, BTW), Amana, Whirlpool, Maytag and Jenn-Air on December 27th of this year. You will be in an awkward position because your quotes will expire much quicker. Gone are 180 quotes. Now you will be lucky for a 90-day price lock. You will also have to take products by specified dates unless your appliance vendor buys it first. So nothing is guaranteed anymore. Then again, most builders are used to hearing that from their steel and aluminum vendors. You will have to pick your partners very carefully these days to deliver a project on time and on budget. Besides LG, most companies have not eliminated promotions. You would think differently because they often cost manufacturers more than the actual tariff increase. You need to plan your purchases around these promotional periods. The best times to buy appliances are Black Friday, President’s Day, Memorial Day, Labor Day, Independence Day, and now Tax-Free Weekend in Massachusetts. Also, the more consistent promotions like Thermador 1, 2 Free or Jenn-Air $1,300 rebates are predicated on buying the entire suite from one manufacturer. You should be prepared to buy from one company to save money. Lastly, you will start seeing shortages in certain brands because of shortages in steel. KitchenAid as an example now has serious issues in product availability. Buy from local inventories as best you can if possible. There are no guarantees you will be delivered your appliances on time as manufacturers deal with the ever-problematic steel issues. You should look at Black Friday for a major purchase and then President’s Day in February. Monitor prices, because until these tariffs are rescinded, you will see shortages and rising prices. 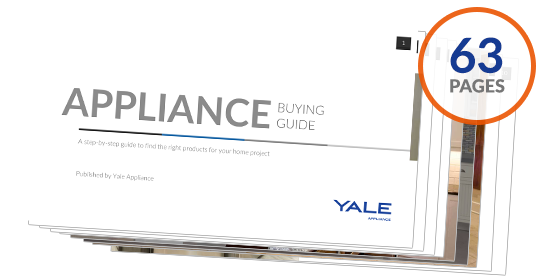 Download our Appliance Buying Guide with features, specs and inside buying tips to every major brand. Well over 355,000 people have read a Yale Guide.